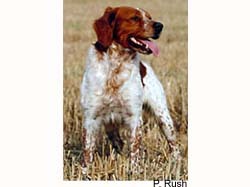 The Brittany is a breed of gun dog that is primarily bred for bird hunting. Although the dog is a spaniel, the breed's working characteristics are more akin to a pointer or setter.As the name implies, Brittanies were developed in the Brittany province of France in the 1800s. Brittanies are mostly white with orange or liver spots. Individuals can have spots in combinations of these colors. Some individuals also have black spots, but this is contrary to breed standard. The coat is of moderate length, dense, flat, or wavy, with slight feathering on the ears and legs. Too much feathering is undesirable as it impedes the dog’s work in thick brush. The breed standard calls for a dog weighing between 30 and 40 pounds (13 to 18 kg) and standing 17½ to 20½ inches (44 to 52 cm). The dog is squareish when viewed from the side, with shoulder height equaling body length (from withers to base of tail). Show dogs have their tails docked in some countries, while the tails of working or companion dogs are frequently left long. The breed is noted for being easy to train, sensitive, and sweet-natured. Many enthusiasts agree that it takes little more than a stern look or cross word to chastise a Brittany. As a consequence, care must be taken during training so as not to break the dog’s spirit. Brittanies are excellent with children, but they are an exuberant breed and may accidentally harm small children. Brittanys get along well with other dogs, and enjoy working with other dogs as a team. The dogs are active and require frequent exercise and room to run. Training for hunting can begin soon after a pup is weaned, around 10 to 12 weeks. A pup is encouraged to search for treats hidden in the handler’s pockets. In this way, he learns that he is rewarded for using his nose. At this time, the pup is introduced to a gamebird in a cage (often a common pigeon). If the dog shows excitement, he is said to be birdy and is rewarded for this behavior. At this stage, some pups already exhibit a natural tendency to point. They are rewarded profusely for this behavior. Dogs progress through several stages, working up to pointing caged birds in the field. A long lead can be attached to the dog at this stage so that the trainer can correct the dog for bad behavior and teach the dog to work closely with hunters. Brittanies are happiest when hunting. Upon reaching the field, a dog usually makes a wide circle. This seems to help the dog establish its bearings and form a "background" upon which game smells will be processed. The dog then begins working back and forth, starting near the hunter and slowly ranging out. The dog repeats this process as the hunters move through the field. How far a handler allows the dog to range is a matter of personal preference. When a pair of dogs work as a team, one works close in while the other ranges out in larger circles. If either dog becomes birdy, the other dog works its way over to assist. Brittanies are alert to their handlers and to the disposition of other dogs in the field. They are ready to comply if the handler directs them to an area of particular interest. When game is detected, a dog freezes, either pointing or crouching. If other dogs are present, they also freeze, "honoring" the first dog’s point. The pointing dog remains motionless until the hunters are in position. What happens next depends on how the dog has been trained. Some trainers train the dog to stay motionless while the hunter steps forward and flushes the game. Handlers give the command whoa, instructing the dog to remain still. Other trainers direct the dog to flush the game with a command such as get it! If a bird is downed, the dogs are instructed to search for it with the command dead bird, or simply dead. The dogs then search for and retrieve the downed game. Brittanies can make first-rate companion dogs, if they are given frequent opportunities to run. Their outgoing nature makes them poor candidates for watch dogs or protectors.